WASHINGTON, DC -- Family Research Council Action, organizer of the Values Voter Summit, will host a news conference at the Omni Shoreham hotel immediately following the conclusion of Vice President Mike Pence’s address to the Summit. Details of a “Values Voter Bus Tour" will be unveiled along with other get-out-the vote activities over the next six weeks. The Values Bus will roll across a dozen states between now and Election Day. The news conference will be held in front of the Values Voter Bus, which is located in the Omni Shoreham Hotel loading dock area just outside the Ambassador Ballroom. WHAT: News conference launching a nationwide "Values Voter Bus Tour"
WHERE: Omni Shoreham Hotel, 2500 Calvert Street, NW, Washington, DC – the news conference will be held in front of the Values Bus, located in the loading dock/parking lot area just outside of the Ambassador Ballroom. 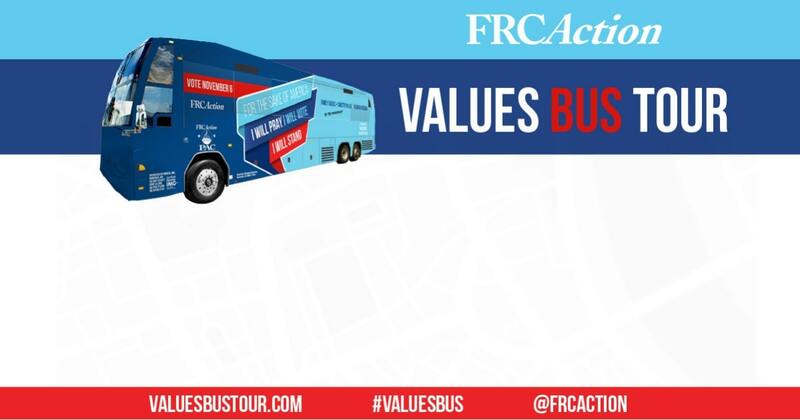 WASHINGTON, D.C. – This week, Family Research Council Action launched its Values Bus Tour that will make stops all across the country leading up to Election Day. The bus tour organized by FRC Action is designed to raise awareness about the critical issues at stake in this election, which include the future of the Supreme Court, religious freedom, parental rights, sanctity of life, and limited government. “The path to a strong America requires first God’s help. Together as a nation we must seek God. We need to pledge to pray, to vote on November 6th, and to stand. This is a pledge that never expires, it is a pledge to always stand for the values that made America great,” concluded Perkins. 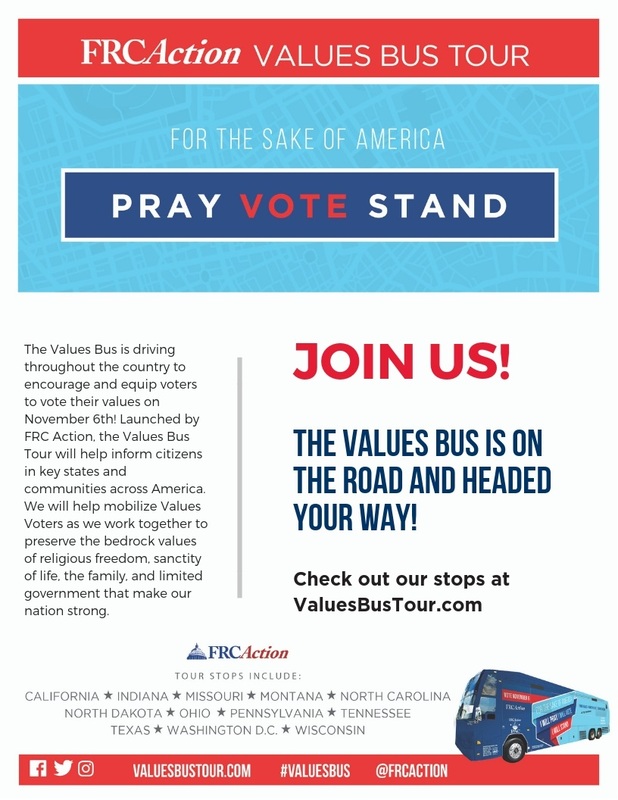 WASHINGTON, D.C. – This week, Family Research Council Action launched its Values Bus Tour that will make stops all across the state of California leading up to Election Day. The bus tour organized by FRC Action is designed to raise awareness about the critical issues at stake in this election, which include the future of the Supreme Court, religious freedom, parental rights, sanctity of human life, and limited government.